Funky outfit Grupo X, from colourful and creative Yorkshire, create 'As The Hills Go By' on Loft Recordings. 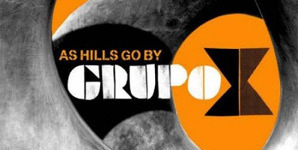 Indeed there is a lot of genuine love of funk, soul and rare groove coming from these hills judging by Grupo X. The tracks range from soulful to upbeat jazz, with a blend of Latin and their own unique 'Pennine' twist, we get a selection of cool tunes to groove or relax to. Title track 'As The Hills Go By' sets the tone, with Lisa Millet controlling the mic, showing talented vocal skills. Her voice combined with the band creates a vibe catered to provide 'moonlight' nights or dance floor boogie. Tracks like 'Won't You Stay' shows a respect for pop formula that has always been understood in the UK, or the fusion of American/UK in 'Waiting All Day' and the groove with 'Closer To You' all seems relevant in the UK.